However they always include and emphasise the word “peaceful” with that phrase. Of course the laws against vandalism, violence, and other behaviour remain in place during protest so in some ways the word peaceful is redundant. It is often the idea that a protest has not been peaceful that is used to justify clamping down on the protest. The police have a number of laws at their disposal to minimise or prevent protest. Section 14 of the 1986 public order act gives police the power to order protesters to confine their protest to a certain place, keep the numbers down, and tell them when to stop. Section 60 and 60AA of the Criminal Justice and Public Order Act 1994 allow the police to stop and search anyone in the specified area with no reason necessary, and to demand that people in the area remove all face coverings so that they can be identified. Recently the police have charged people with Aggravated Trespass – a law intended to be used against raves – to place more restrictions on where a protest can take place. Dispersal Orders may be put in place, creating a Dispersal Zone in which a police officer may order a person to leave the area with no reason necessary. If you are organising a march, you are legally required to notify the police six days in advance, or as soon as it is reasonably practical to do so. If you are organising a protest rally that will not involve a march, you are not obliged to notify the police, but you may still want to let them know. Police always insist on agreeing in advance the route that a protest march will take. They talk to organisers or representatives of the protest to find out the proposed route, often imposing changes on it, and then any protesters leaving the route are used to justify clamping down on the protest. This is especially problematic in protests where there are no central organisers or where many additional groups have joined the protest but do not accept that any people represent them when talking to the police. The normal response to protesters not doing exactly what the police want is containment. Containment, or kettling, involves enclosing the crowd with lines of police officers, vans, horses, buildings or barriers, and holding them there for hours. Often the police attempt to close in on the crowd and crush them. It is quite deliberate and police can be seen pushing in towards the crowd in a very deliberate and organised way in various videos taken from previous protests. When the people are treated like this it is almost a certainty that they will get angry with the police and people at the edge will be pushed towards the police by those being crushed in the middle. The police response is to hit people and scream at them to get back and so it should be obvious that containment will only ever cause and inflame violence, mostly starting on the police side. The purpose of containment, apart from keeping protesters away from other people, appears to be to destroy people’s will to protest. The containment usually only ends when people are tired, hungry, cold, and prepared to submit to being photographed and giving their details to the police. It is arguable that this is a deliberate deterrent against protesting in future. People fighting in court the use of containment have argued that it is a form of collective punishment. That is, it unfairly punishes all who are at the scene instead of just those that may have been causing trouble. Many other people are also intimidated by the threat of containment and put off of attending protest by it. The collection of photographs and identities seems to be another intimidation tactic. Forward Intelligence Teams video and photograph people at just about every protest. It seems to be routine now for police to gather names and addresses from any protesters that have been caught up in containment, threatening arrest if the person is not cooperative and even arresting and then de-arresting in order to circumvent the law and get details. I believe that this is intimidation by the police. They build up a database of people who have attended protests and this can only be for use in identifying people at future protests – the idea that attending lots of protests makes a person a trouble maker – and the implication is that attending protests is a crime when it is not. Apart from intimidating people out of protest, people can also be prevented from protesting by the courts. 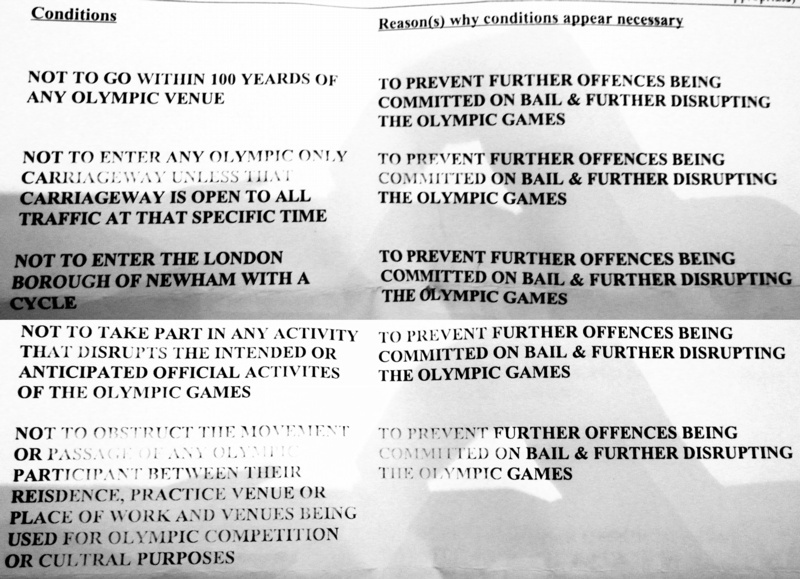 People who have been arrested at Fortnum & Mason and at Dale Farm but not convicted of anything have been banned in their bail conditions from the City of London and from Essex respectively. People who were arrested ahead of the Royal Wedding were also banned from London even though they had not even done anything to justify arrest. In September three activists were arrested for suspending a banner from a bridge in Birmingham while protesting at the Liberal Democrat conference. Two of those arrested were released on bail, (and banned from Birmingham) but the third was held in custody for ten days because he had previously been arrested at the Fortnum & Mason protest. He has not been found guilty of anything at that protest, and yet because of it he spent ten days in prison while not being found guilty of anything at the latter protest. This is definitely intimidating to potential protesters. As if that isn’t enough, many people who had previously been arrested at Fortnum & Mason and at Dale Farm received letters from the Metropolitan Police warning them not to commit criminal or anti-social behaviour, to move away from any violence, and stating that they could be arrested at the earliest opportunity should this advice be ignored. I believe this to also be intimidation designed to keep protesters away from protests – both those who received the letters and others that saw them. Now ahead of several protests on Wednesday the 9th, Commander Simon Pountain of the Met police – who is in charge of policing during the protests – has given several interviews and in each has explicitly mentioned baton rounds. (Also known as plastic bullets.) He has stated that he will have units armed with baton rounds parked nearby and on standby to be used in policing the protests, and that he wanted them on standby so that he would not have to wait an hour or two for them to be deployed. He expressed a willingness to use them in certain situations which do not seem so unlikely. This is yet more intimidation by the police. Both their announcement that baton rounds will be on standby and the mere fact that Pountain talked about them to several journalists is very worrying and will intimidate and put off yet more protesters. Taken as a whole, I believe that all of this shows that the police have far over-stepped their boundaries and are illegally curtailing the right to protest. Governments both Conservative and Labour have introduced authoritarian laws that also overstep the mark. This intimidation cannot be allowed to stop protest. Governments and police are not supposed to like protest, it is designed to make them uncomfortable so that they change their policies. Obviously it is working.